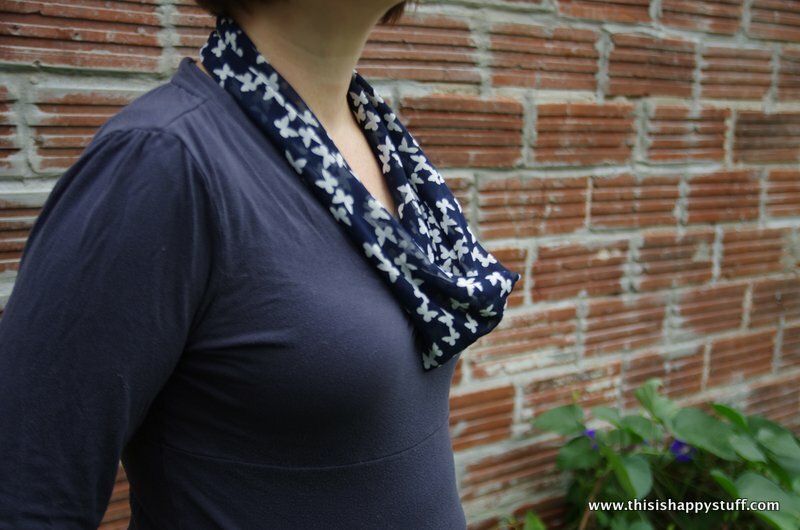 a fashion sewing tutorial: the conundrum scarf (& a giveaway!) | happy stuff. 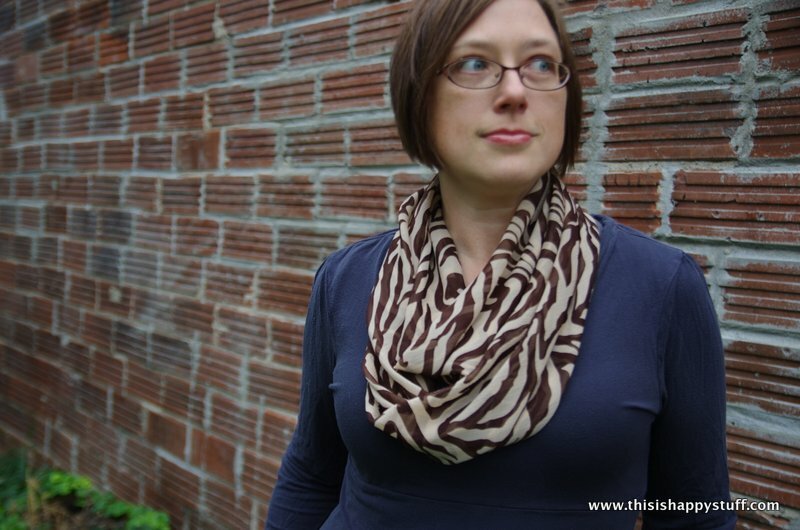 i recently found a vintage “infinity” scarf at a local resale shop that i loved for its size, light weight and easy wear (it’s no more hassle than a necklace!). i studied the construction and realized it was sewn on the bias and had a subtle center seam along the inside. i bought it, but knew that if i wanted more, i’d have to make them myself. i went home and searched online for “bias cut infinity scarf” tutorials and came up empty-handed. there are a million and one infinity scarf tutorials, but only ones that follow the grain of the fabric. the bias cut (bias=fabric is cut on a 45° angle instead of perpendicular to the weave) is key to making this pattern work well (especially with gauzy or crepe-like fabrics) because it gives the circle a bit more stretch and a lovely, soft drape. i began developing my pattern. over the course of two days, i cut out multiple versions of this scarf in several different kinds of fabrics and different sizes. i ripped stitches out countless times. 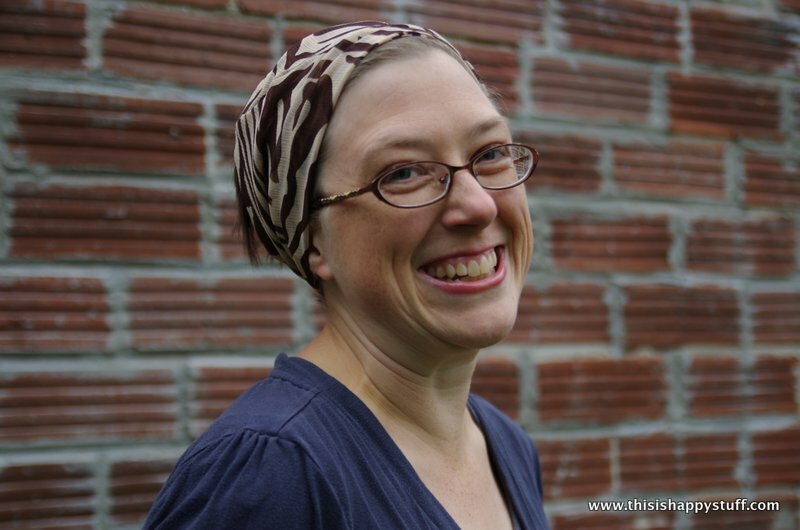 each time, i thought i’d figured it out, and the i’d turn it right side out and realize that once again, the center seam that was supposed to run around my neck, instead ran perpendicular to my neck and the scarf was in completely the wrong shape. there was something fundamentally confusing about this pattern–it has to do with three-dimensional geometry and logic, but even my logic-minded husband could offer no more helpful advice than, “sew it the other way.” for two days, i tried to “sew it the other way” and when i finally, finally figured it out, i had to share it with you. once you know the trick, it’s simple. just two seams and you’re done! but first, you have to figure out how to cut out a parallelogram on the bias. ready? let’s try it! 1. cut out a parallelogram from your fabric, where the “straight” edges are cut on the 45° angle. 3. lay your tube flat on a table and flop the bottom edge up to the top edge. all of your raw edges should now be aligned (four layers). 4. pin the very top layer of fabric to the very bottom layer of fabric (leaving the middle two layers free)–just a few pins will do. 5. sew all the way around the circle (leaving a hole to turn it inside out). 6. turn it inside out. press it (optional). stitch the hole closed. done. now the fun part. 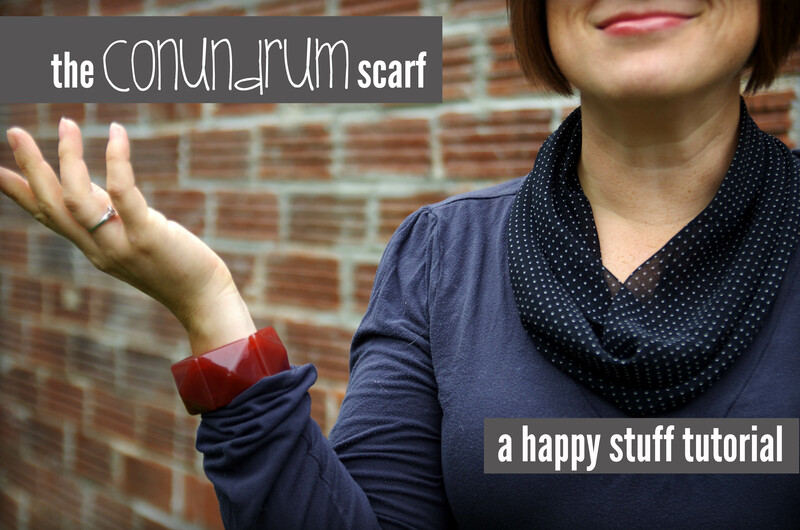 i’m giving away three conundrum scarves to one lucky reader! 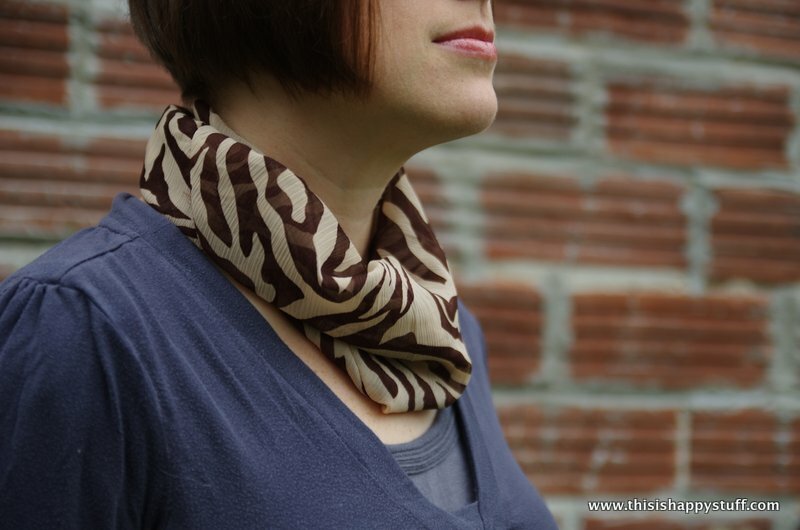 If you would like to own the navy + butterflies scarf created in the video, the striped wrist cuff and one of the brown zebra-print long scarves, simply leave a comment on this post telling me whether you preferred the video tutorial or the written instructions and whether there’s any part you’re still confused about. you can earn extra entries by tweeting about this post (use the hashtag #conundrumscarf so i can find your tweet), and/or pinning this post on pinterest. i’ll also give double entry points to anyone who makes a conundrum scarf, then shares photos online (your choice of venue, please link back to this post! )–be sure to come back and leave a comment here including a link to your photo! the giveaway ends at midnight, sunday, september 30 and the winner will be announced sometime that week. p.s. 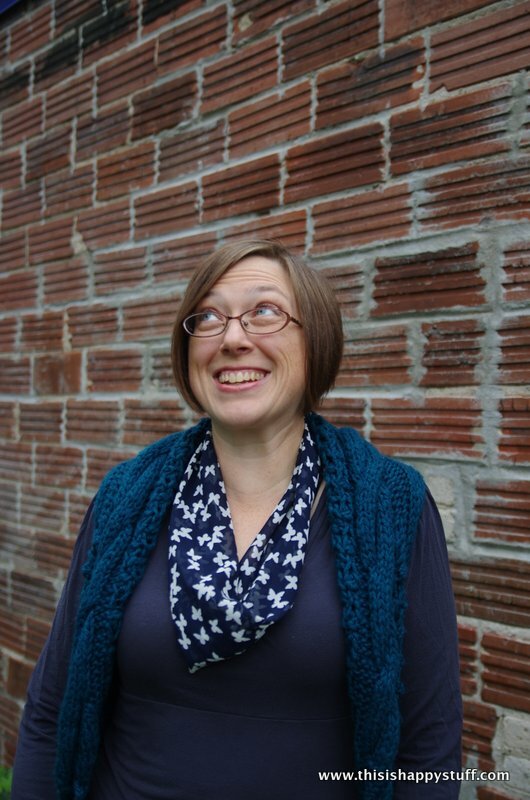 many thanks to nicole for the fantastic photographs in this post and to alison for the video segments that open and close the video tutorial! This entry was posted in crafty stuff, style, tutorials. Bookmark the permalink. First of all, you look gorgeous! Second of all, your video tutorial is beautiful! Love the depth of field, the color, the varying shot angles, and all perfectly practical and viewer-friendly. You’re kinda rockin’ this thang! To comment officially: I like to see HOW the scarf is made, so I appreciate and prefer the video over the written how to, but I freely admit that I like having both at the ready, so that I can make clear sense of what it is you’re doing in the video. I will also freely admit that if I were to try to recreate the look of this scarf, I would have started no where near the cut-on-the-bias, parallelogram world. I would have cussed and sworn over a simple rectangle tube and then been disappointed with how it didn’t turn out. ;) But this is why I play with paper, instead. Well done, you! i love that as a headscarf! what i really want to know, though, is will we be seeing that blue knitted thingy you’re wearing in the future? it looks chunky and fabulously warm. 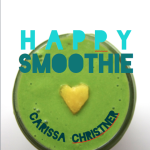 Okay, first— I believe you can make or do anything, Carissa! You are fantastically talented in so many areas that I am awed all the time. Second— I have always been a-feared of sewing on the bias. It just *seems* harder and there’s more stress on the fabric, but you make it look effortless and doable. What?! You’re giving those away? As a total hoarder, I applaud you. I liked both the written instructions and the video– I’m more of a written direction person, but it’s nice to have the visual to really bring life to the instructions. Oh! I think your pattern for this is genius. I didn’t get it from the written instructions – I needed to see it in the video to understand each step. Such a lovely scarf! 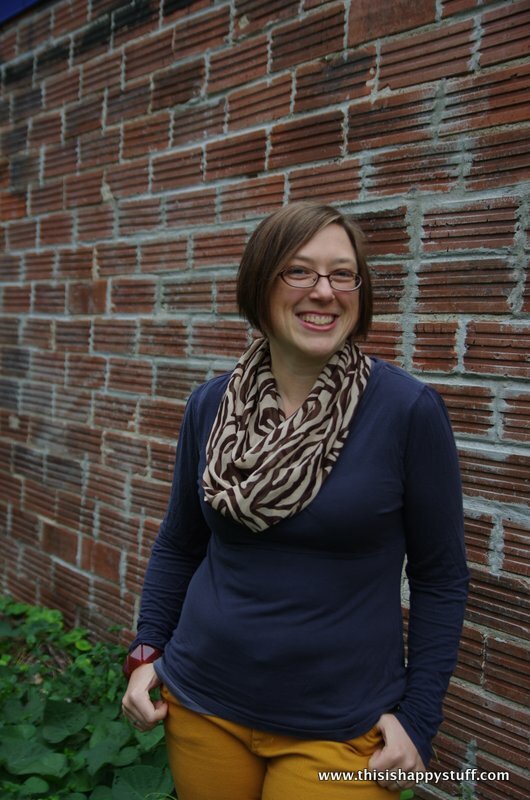 You totally “WOW ME” every time with your projects (and photos, writing, and documentation of them as well!). You are so talented (and gorgeous) to boot. Your recent fashion series has definitely inspired me to try many of the things you are doing and to work at accessorizing more. 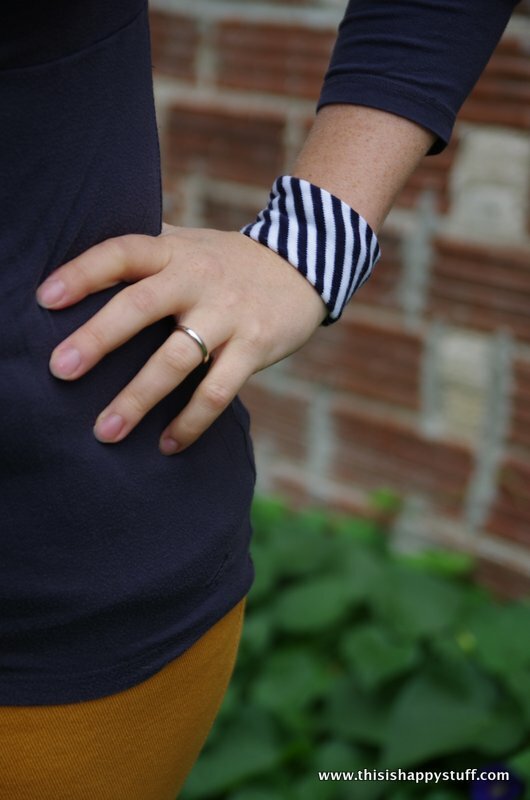 With something as simple as this, easy to make, and yet so versatile, it’s perfect for me. It’s right up my alley. I would love to make some of these scarves, but alas, my free time at the moment is very limited. After my “happy baby” grows into a “happy toddler” then I hope to crank some of these out. I will certainly send you some pics when I do. In the meantime, I am loving this chance to win some of your originals to “tide me over” until that elusive free time shows itself. The video was the most helpful for me, but I know I would also rely heavily on those written instructions too, to easily refer back to when actually making the scarf. Thank you for sharing this awesome tutorial! P.S. I remember you from my days at GC. I was a few classes behind you and Mr. 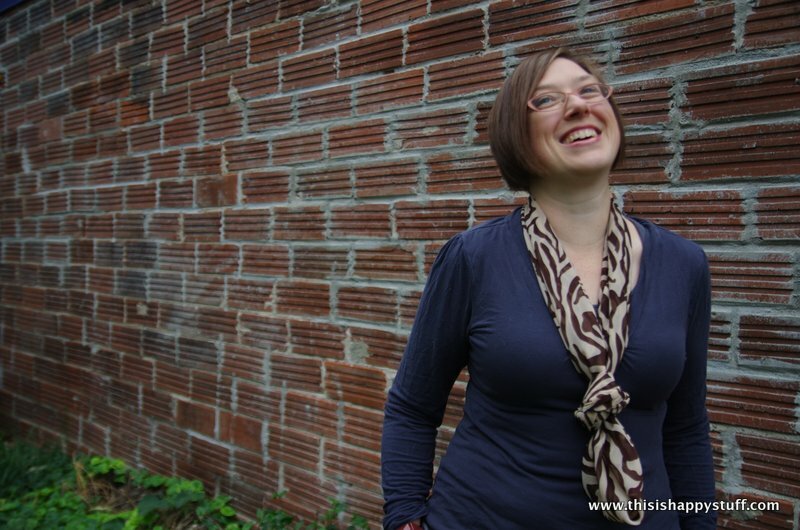 Happy Stuff, but I am lamenting the fact that I didn’t cross paths and get to connect with you then, as I would love to meet you in person and have you as a friend now! Keep sharing your creativity and craftiness. You have a devoted fan here… you’re amazing! Super, duper. I love the length and the weight of this pattern. It’s been pinned for future reference. Not that I would forget where I found it, but you know. It’s cool. My “pinny” friends should see it, too. p.s. I used my jar cozy this morning for my steel cut oats in a jar breakfast. I’ve been making a crockpot full of steel cut oats to eat in the mornings and I portion them out in jars and then take them along for work. I love the rainbow cozy I have to carry them in and help keep them warm. THANKS! I’m totally a visual person, love the video! Great scarf! I never have the patience for video tutorials, so I will go with written instructions! I see I”m in the minority here. My bias scarf turned out beautiful. it is shear and longer than I planned so I can wrap it wound my neck twice which makes if even more full and beautiful. wow! Earlier, I had i cut out my bias as i figured that with my long time experience, I could get this together. However after I sewed the ends together, I pondered about what to do next. It was then that I remembered to Google the directions. The script on your site was very light and difficult to read. I watched the video, but wish that you would have talked at each step. i had earlier done every step as you described, until I got to the fold it over and sew the two outside edges together. I went to some other sites but those did not give me what I needed. I went back and re-read your directions for that step. I sewed it together and presto it worked and was beautiful. I managed to make one of these tonight…but not without some confusion! Can you post some pictures (or explain to me in detail) how you cut your large piece of fabric? Maybe I’m having a tired Mommy moment, but I had a hard time figuring it out and I don’t know if I could do it again! The video was very well done and helpful. I bought some beautiful soft print fabric, and was searching for a way to be sure the wrong side never shows. Back in my college days, I used to line suit jackets with a silky (polyester) print, and then make one of these scarfs from the scraps. Thanks for the refresher. Again, VERY WELL DONE! The written instructions were helpful for me. Love the scarves. Thanks for the giveaway. Wow, that was a conundrum! The video explained everything perfectly, but I still thought I knew better than the instructions and thought, “huh, maybe her scarf needs to be sewn that way, but MY scarf needs to be sewn the OTHER way.” Nope. Had to unstitch it and sew it again! What a mind bender! Absolutely loved your video! Loved the way you showed a paper version AND a fabric version! And no talking! I had no trouble following along and I got the gist of how to do it. This really is one of the best how-to videos I’ve ever seen (and I belong to a few membership sites with videos not nearly as straightforward, or as quick, as yours). I realize that it’s now 4 years since you posted this. I look forward to seeing what videos you’ve posted since! Thank you for sharing this tutorial. I made a scarf from hand-dyed silk dupioni for a Christmas gift to someone who I think needs something handmade this year. It turned out beautifully, and I know I’ll make more using this idea. Thanks again – I didn’t have excess fabric to experiment with!